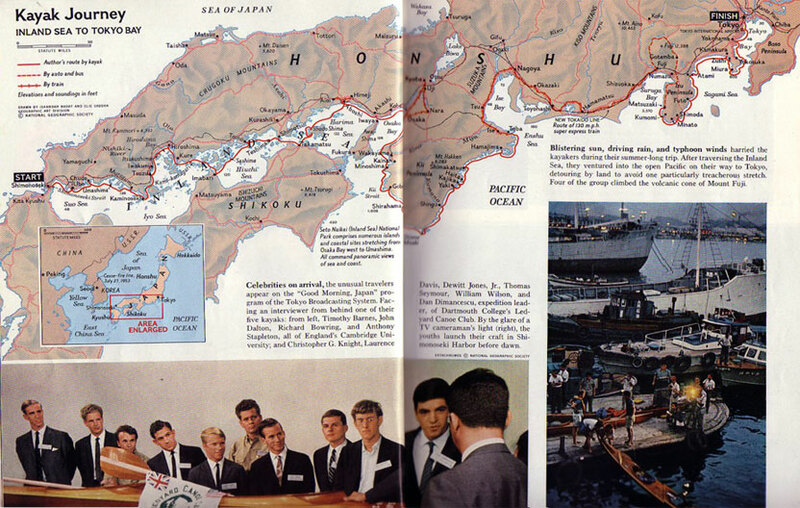 Dartmouth Japan Expedition – 1966 (Ledyard Canoe Club). The Dartmouth team invited four British individuals from Cambridge University to join the expedition. Lft to Rt: Camb Univ: Timothy Barnes, John Dalton, Richard Bowring, and Anthony Stapleton; Dartmouth: Christopher Knight, Laurence Davis, Dewitt Jones, Thomas Seymour, William Wilson, and Dan Dimancescu; seen on “Good Morning Japan” Tokyo TV and launching their kayaks in Shimonoseki (Honshu). Hand crafted wooden Swedish-built kayaks were used to travel the 1000 mile (1600 km) distance in the Summer of 1966. Reported as a cover story in the National Geographic Magazine (September 1967) and an NG sponsored film was produced by Dewitt Jones. The group received generous support from Sen. Robert F. Kennedy, other individuals in the US and Japan, the Nikon Corp. and was featured on national Japanese TBS-TV periodically.